This Tulip Poplar Tree is a seedling of the last remaining Liberty Tree, which was planted in Boston as a tribute to the Revolutionary War. Its original seedlings were distributed to the thirteen colonies in commemoration of liberty and of the nation’s founding fathers. This seedling is an original descendent of this Liberty Tree, which was planted on the Boston Commons as a symbol of freedom and patriotism. This seed was planted in Freedom Park in 2007 and serves as a memorial to the founding of the United States. The Liberty Tree is maintained in part by the Mecklenburg County Parks and Recreation center. Local arborists, including Patrick George and Mike Orell, maintain additional preservation efforts and are part of a group of native Charlotteans dedicated to educating community members about the importance of sustaining and cultivating local greenery. The May 20th Society, American Forests, the Providence Forum, and Mecklenburg County Park and Recreation dedicated the tree. 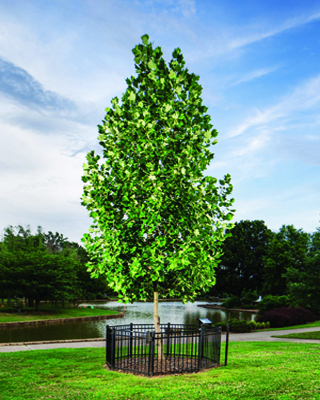 The Liberty Tree was planted after Rick Roti, a Charlotte lawyer and arborist, advocated the city’s decision to plant the seed in homage to the original tulip poplar liberty tree. In the 1980s, Tom Martin, urban forestry agent for the North Carolina Cooperative Extension Service, formed a committee to identify and catalogue notable trees in the city. 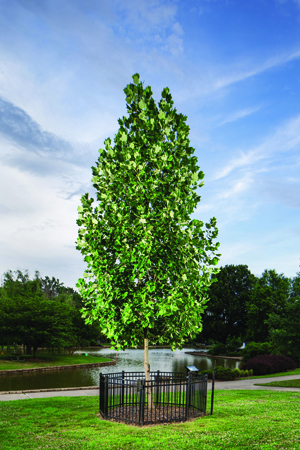 The Liberty Poplar is one of one hundred and twenty three that Martin and his team have catalogued. In 2010, an unknown person/persons unsuccessfully attempted to chop down the memorial. Little is known about the incident. Now, the tree remains bounded by steel frame; it has “wound wood” appearing at the site where the tree would have been split. The Liberty Tree is located in Freedom Park, near the historical Dilworth and Myers Park communities. The tree is surrounded by a black iron fence in an open field in the middle of Freedom Park. It is near paved sidewalks, rows of benches, and a pavilion.